A continuation of the 2009 hilarious adventure game developed by KING Art Games that tells a story of the search for a powerful magical artifact. The Book of Unwritten Tales 2 for PC, PS4 and etc. is a continuation of a well-received, humorous point-and-click adventure game. The Book of Unwritten Tales 2 has been developed by the Dutch KING Art Games in cooperation with Nordic Games Publishing – this is the second publisher KING ART has been working with; the first one, Hamburger Medien Haus went bankrupt. The new partner of the Dutch developers helped them with publishing their game on different platforms, thus broadening their fandom. 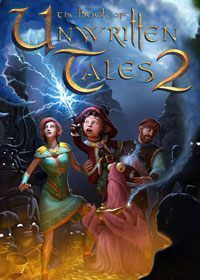 In The Book of Unwritten Tales 2, players get to control their old friends – Wilbure the gnome, the elvish princess Ivo, the bounty hunter Nate, and the amiable creature named Critter. The story sets off one year after the events from the series’ first installment. The Kingdom of Aventasia has fallen victim to a mysterious plague that turns sinister beasts into sweet puppies, while the powerful castles are transformed into dollhouses. In the face of this unexpected turn of events, the group of heroes undertakes the task of reaching the source of this phenomenon and solving its mystery. A player gets to control each of the four available characters separately. However, there are times when it is necessary to control two or even three simultaneously. As befits a point & click adventure game, The Book of Unwritten Tales 2 features many logical puzzles and side quests – designing additional quests was possible thanks to the support of the gaming community that funded the game through the Kickstarter campaign. The Book of Unwritten Tales 2 features visuals similar to those from the previous installment, however, developers have improved them significantly. Character models were created in 3D, while the entire game is set in a colorful and humorous style that matches the light-hearted spirit of the story it tells.